PITTSBURGH, PA. – On Saturday, a pile of dark green plastic Post-Gazette newspaper bags began piling up outside of the mansion of Pittsburgh Post-Gazette Publisher John Block in the high-end Shadyside neighborhood of Pittsburgh. However, the bags weren’t filled with copies of the Pittsburgh Post-Gazette, but with copies of the “The Hard Times”. 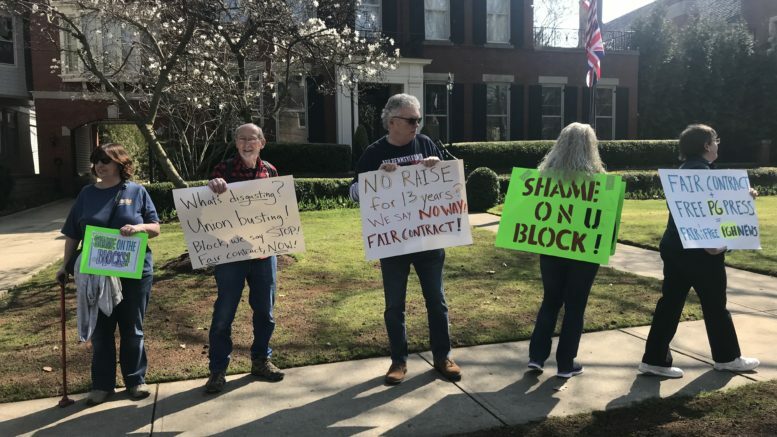 On Saturday, a dozen community activists picketed Pittsburgh Post-Gazette Publisher John Block’s home and distributed the Hard Times to his neighbors to draw attention to Block’s union-busting track record. “You know what Saul Alinsky always said the best way to put pressure on someone is to distribute flyers to their neighbors and at their church,” laughs community activist Mel Packer as he helps organize the little green newspaper bags for distribution. Protestors outside of Block’s house were angry about Block’s treatment of the union at the Pittsburgh Post-Gazette. Despite numerous orders from the National Labor Relations Board to bargain in good faith, for nearly two years, Block has dragged his feet on agreeing to a union contract with reporters at the Pittsburgh Post-Gazette, who haven’t seen a raise in more than 13 years. Late on a Saturday night of February 2nd, things came to a head when an allegedly drunk John Block showed up to the newsroom of the Pittsburgh Post-Gazette with his 12-year-old daughter in tow. Block began screaming at reporters about a NewsGuild bulletin board that said “Shame on the Blocks”. 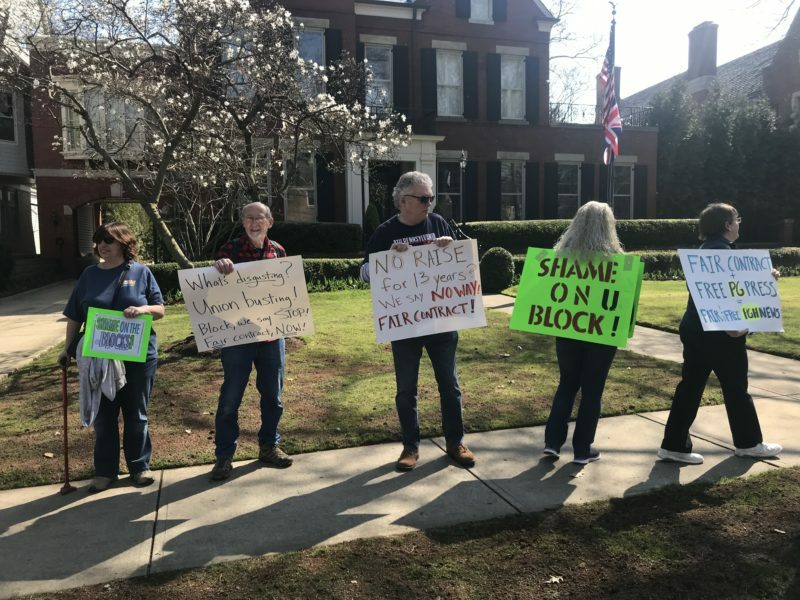 According to the accounts of various reporters in the newsroom, Block called for the Post-Gazette’s photographer to come to take a photo of him and his 12-year-old daughter posing in front of the sign that said “Shame on the Blocks”. Block began yelling at his crying daughter when she refused to take a photo. According to multiple eyewitnesses, Block got up in his daughter’s face and yelled “You’re a Block don’t you forget it. You’re a Block, you’re not one of them,” while he made a series of deriding comments about what “working class trash” the newsroom employees were. “Those comments about you don’t want to be like “these people” really hit me in the heart because there is nothing wrong with working people,” says Scanlon. “So I decided that I don’t have anything to do this afternoon so let’s do a picket”. On that first February afternoon, Scanlon found herself marching alone around the Pittsburgh Post-Gazette headquarters with a sign all by herself. But as news of her lonely protest spread, others in the community began contacting her about wanting to get involved. “There is a real concern right now that the Blocks aren’t simply dictating the editorial page of the paper, but also the newsroom in terms of what they choose to cover,” says Just Harvest community organizer Helen Gerhardt as she holds a sign highlighting the paper’s positive labor coverage. “We really want to stand up for independent newsrooms,” says Helen Gerhardt “And I think because of this struggle, they are becoming more engaged with the needs of the community”. In the age of Trump, the labor movement is increasingly seeing its cause allied with standing up for a free press. “We are under attack from so many angles, but to take away the news and to silence us is basically muzzling and we can’t have that happen,” says Sue Scanlon as community activists marched in front of Post-Gazette Publisher John Block’s mansion on a picturesque Saturday afternoon. Be the first to comment on "Protesters Picket Home of Publisher of the Pittsburgh Post-Gazette"